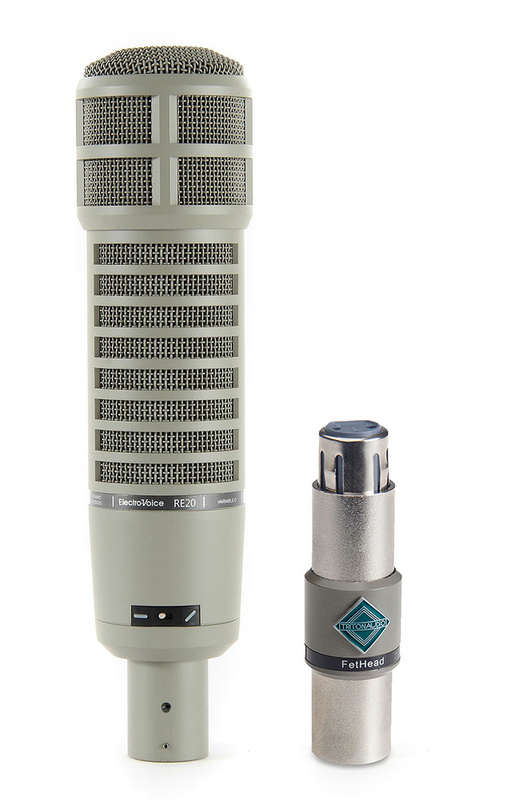 If your mic preamp is struggling to deliver enough quiet gain for a mic such as the Electro-Voice RE20 discussed here, an in-line preamp such as the Triton Audio FetHead can help. I don’t use my [Electro-Voice] RE20 mic all that much, but when I do I find it needs the preamps turned up an awful lot to capture usable audio, and consequently there’s often a hum in the recording — associated with having a preamp turned up too much. It’s fine for brass/percussion but for spoken word it’s very quiet. With the speaker two inches from the mic, facing straight at it, the gain needs to be turned to 11. Is this my poor technique? A faulty mic? I’ve run it through UAD, Focusrite 428 and Audient mic preamps and it’s always the same. Technical Editor Hugh Robjohns replies: It is quite normal to need to run the mic preamp at maximum gain when using an RE20 for speech. Given its sensitivity of 1.5mV/Pa, a sound level of 70dB SPL (gentle speech) at the mic will produce an output level of -78dBu, so you’re going to need a lot of gain to raise that to a decent line-level signal. The hum is a more troubling issue. There are lots of possibilities! I think I’d try switching other equipment off to see if anything is radiating a strong hum field first. You could experiment with moving the mic cable around too, to see if that makes any difference. Some mic cables are wired with the XLR shells linked internally to pin 1, and some aren’t. In theory, they should be linked but the presence or absence of that link can both cause and prevent hum problems, depending on the design of the equipment the cables are plugged into, so that could be worth experimenting with as well. And finally, it’s not unusual for preamps running at very high gains to pick up mains hum from their own internal power supply. In this scenario, an in-line gain booster such as the Cloud Mics Cloudlifter, Triton Audio FetHead or the MartiAudio In-line Preamp Booster should help.